Two excellent new games, one from MicroGaming and one from Net Entertainment will hit your screens in December. This page gives you a preview of what to expect, and shows you the best place to play these new releases first. As we end 2016, I feel like the quality of online slots is at an all-time high. While there was a race to make these games as complex as possible – it now feels like the focus is on keeping the visuals and playability high. Sure, all new slots have a few bonus games (today’s demanding audiences would expect no less! ), I feel that the basics are getting better and better too. 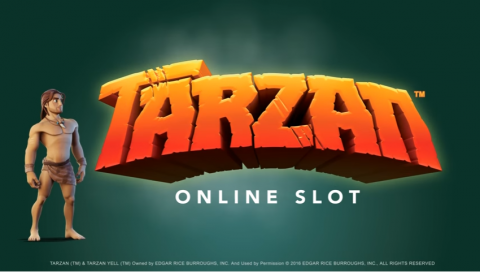 The games covered here are MicroGaming’s Tarzan Slot and ‘Dead or Alive’, a Western themed slot from the smart minds at Net Entertainment (NetEnt). You’ll recognise all the clichés from the Tarzan TV programs and movies in this colourful new game. There is a 3D Tarzan avatar to the left of the reels. He will react to the spins and get active when you hit a big win or one of the bonus games. On the reels you’ll find Jane and the monkey. If you want to see the famous ‘call’ or have Tarzan climbing a vine to use as a rope swing, then you will need to hit the bonus game. This starts out with a wheel. You can win 200x your spin amount, free spins or a bonus game. The bonus game is a pick-em, based on picking out hippo’s from a river. Free spins sees a new background (Tarzan climbs a rope to get there). Here you get cascading wins. Winning combos disappear, and new wins fall into their place. I like the look of this one. The 3D graphics are crisp and the animations smooth. There is enough going on to keep you engaged without going over-complex… and that big win potential is certainly there! For the best MicroGaming Slots, as well as those from IGT, NetEnt, PlayTech and many more, I recommend www.unibet.com (you’ll also get 50 free spins on a famous NetEnt jackpot slot with your first deposit!). The Wild West / Cowboy theme has been made into slots many times. My question with Dead or Alive from NetEnt is whether this competes with those already available. This has a darker atmosphere than many games. The muted colours and lightning in the background make this a dusty and dark game… There appeared to be plenty of wild symbols to create more wins too. There is just a single bonus game, which is based around free spins. Here the wanted posters become sticky (as well as wild) which means a lot more wins the spins move forward. You can also win more spins by collecting all of the posters. I liked this game, it is not flash or elaborate – though looks every bit like an enjoyable and playable NetEnt title. Unibet are more than just my top rec for the latest MicroGaming and NetEnt titles – you’ll find more than 600 games from all of the best slot software houses there. Combine this with a reputation as one of Europe’s biggest gambling sites (their sportsbook is huge and poker room is growing fast) and you have a combo which is worth a look. Unibet offer new depositing players 50 free spins on one of the most popular NetEnt jackpot slots. There are also plenty of promotions and player offers (check the site for the latest list, as these change every week!). Check out Tarzan and the new Dead or Alive slots at www.unibet.com today!